Coho is the aspiration of vintner Gary Lipp to produce flavorful, balanced wines. 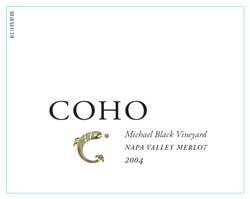 Grown in select cool-climate vineyards, Coho wines emphasize fruit purity and vitality. Gary's experience working for California wineries totals more than thirty years: he's been involved in all aspects of winery operations, acquiring the skills to bottle his passion. The choice of Coho as the name of the brand might seem curious as it doesn’t invoke images of vineyards or wine, but to me the salmon embodies an innate wisdom so essential to understanding ourselves and our environment. As stewards of the land winemakers must strive to sustain our habitat and the species that share it. And like the salmon we need the steadfast will to keep going no matter how difficult the journey.